The Midwest may be in the grips of an icy polar vortex of historic proportions, but road crews in St. Louis County, Minnesota have a new tool in the fight against winter weather. 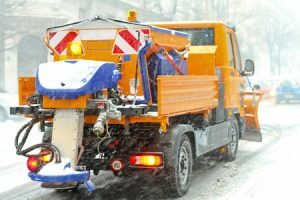 Earlier this week, the county department of public works announced that they’re preparing to deploy four new trucks that use an innovative anti-icing system to keep roads clear during snowstorms. In contrast to conventional salt trucks, these vehicles feature “plug-and-go” chassis that can be equipped with either brine tanks or precision salt applicators. Prior to a forecasted winter weather event, the trucks will use their brine tanks to pretreat roads with a solution that prevents ice and snow from bonding to roadways. This brine solution can be modified with additives to suit different air and road surface temperatures, and it reportedly remains effective for several days after application. This, in turn, can reduce the amount of salt that’s required to keep roads clear during a snowstorm by as much as 40 percent. Once precipitation starts to fall, the trucks will be sent back out with their precision salt applicators to prevent ice and snow from building up on roadways as well. These applicators can be rotated in a 22-degree arc that makes it much easier for operators to apply salt evenly around corners and on hard-to-reach sections of pavement. Together, the brine tanks and precision salt applicators offer a more effective, efficient way to control ice and snow on some of the area’s most heavily-trafficked roads. At Rackers Equipment Company, you can find a diverse selection of used highway paving, maintenance and construction equipment at affordable prices that can’t be beat. Browse our inventory online or give us a call to find a great new addition to your fleet today!